Volume II – The SHADOW full court press. A flexible full court press that can be used to impact the tempo of the game. The SHADOW press is mainly used as a three-quarter court containment press. 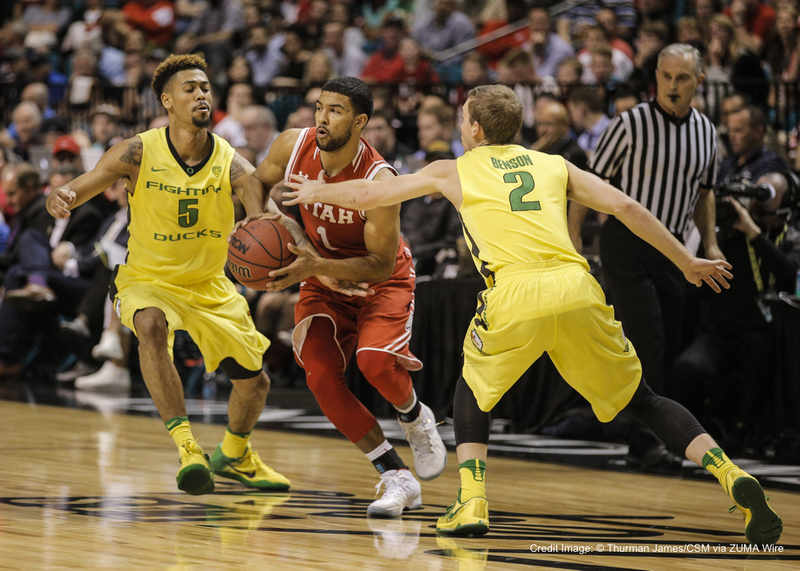 It does have the flexibility to be a tempo reducing press to slow down a fast break attack or an aggressive press designed to force turnovers. The trap option of the SHADOW press is aggressive and seeks to create turnovers, but it lessens the risk of being thrown over the top of by the placement of the “shadow” player. With the ball out of bounds, SHADOW looks like a man-to-man press. Unlike the FACE press, the inbounder’s defender is backed off the ball and sitting in the hole to deter a pass over the top. In the diagram below, Player 4 is backed off the ball and playing behind the offense’s desired outlets. This is the “shadow” player. Coaches may designate a shadow player or simply state that the defender assigned to the inbounder become the shadow player. Their position prevents the pass over the top to Player 1 who is being aggressively denied by X1. Players can ramp up the denial knowing they will not be thrown over the top of due to the placement of the shadow player. Once the ball is entered, the SHADOW player stays eight to ten feet behind the ball. X1 assumes a pass denial position against Player 1. If/when Player 1 receives the the ball, X1 assumes and on ball position pushing Player 1 to the sideline checkpoint. X2 assumes a pass denial position against Player 2 then rotates to Top I helpside denying any pass to the middle. X3 assumes a pass denial position against Player 3 denying the critical pass up the sideline. X4 playing off, SHADOWS Player 1 and locks up with X1 trapping Player 1 near the sideline checkpoint. X5 assumes a helpside Low I position against Player 5 and protects the basket. NOTE: If the inbounds pass goes to Player 2, the SHADOW player (X4) teams up with X2 to trap Player 2 and X1 assumes the helpside Top I position. 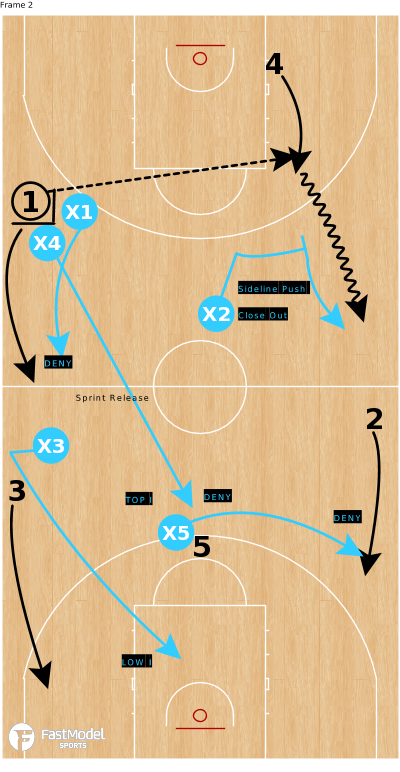 X1 and X4 lock up Player 1 without fouling. The pass out of the trap gets us to Phase Two of the SHADOW press. X1 maintains a pass denial position on Player 1 preventing any return pass. X2 closes out to an on ball position against Player 4 pushing them to the near sideline checkpoint. X3 assumes a Low I helpside position against Player 3 and is responsible for basket area. X4 sprint releases to top of circle and closes out into a psss deny position against Player 5. X5 rotates out to a pass denial position against Player 2. Extending the defense can be a potent and important weapon at times. However, the effectiveness of a press is dependent on the execution of the basic individual defensive fundamentals and timing. Trapping in proper areas with proper angles and helpside positioning are vital components to any press. Quick rotations are also key to a successful press. The SHADOW press with this trap option is best deployed when behind to mount a comeback or to force tempo against an inferior or slower tempo opponent. It has less risk that the FACE press as a result of removing the over the top lob option for the inbounder. For help with practice planning and implementation of a pressure defense attack featuring the above concepts please reach out and join our community for basketball coaches!